If the start of the school year makes you feel old « "TeresaBruceBooks"
The leaves don’t change color much in the South Carolina Lowcountry, we tell the change of seasons more by the shades of the marsh grass. It doesn’t FEEL like fall is approaching, when 90-something describes both the temperature and the humidity. But I have a wave of friends sending their babies off to first grade this year, ready or not, and something in their collectively long faces tells me it makes them feel old. That time passes too quickly. So here is a little Byrne antidote for the syndrome. Ladies, it’s all relative and there’s no rush. You’ve seen this picture before, right? Guess how old she was when it was taken? 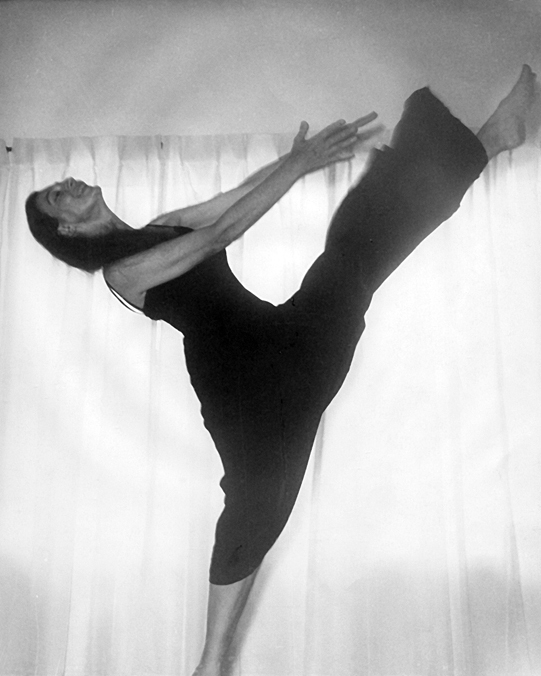 Byrne started seriously studying dance in 1934, which, at age 25 was quite late for a dancer. She was on a scholarship with the leading dance school in New York at the time, Harold Kreutzberg’s NY School – he was the Balanchine of his day. Her performance career came even later, when she already had her two daughters…Alison in 1938 and Jane in 1941. She told reporters “I performed mostly in my 40s and 50s when most dancers with any sense are starting to retire.” What’s so cool about that is that she didn’t feel she had to choose between having a family and dance – or that if she took time out to raise her daughters she’d be too old to follow her dream. She started the Byrne Miller Dance Theatre in 1969, as its 60-year-old principal dancer and choreographer, and brought it from Santa Fe to Beaufort initially as a performance group. But her true calling was in her discerning eye for talent, and by 1972 the Byrne Miller Dance Theatre became a presenting arts organization. For the next 25 years, she brought legendary companies to Beaufort. With four concerts a year, that’s literally thousands of South Carolinians exposed to live dance of the highest caliber in the world. Every fall, she rubbed her hands together with glee at the thought of little kids trundling off to school. More minds to inspire and bodies to challenge! By Christmas time, they’d all be riding school buses for a field trip to watch her presentation of the Nutcracker. And another generation would be exposed to and enchanted by the magic of the arts. This entry was posted in travel and tagged dance, School. ….definitely feeling old, although the start of school doesn’t seem to make me feel that way. Perhaps its the accumulation of years – but Byrne’s example puts the lie to that. Oh, well. Maybe I can generate some “sprightly” moves…and if that doesn’t work, maybe Byrne’s comments will inspire me to begin an affair! Now that’ll make me feel younger, for sure! Wow! Really inspiring Teresa. I had no idea Byrne started dancing so late and kept dancing for so long. How very marvelous! It’s interesting to make the connection with Suzanne Larson, a playright and artisan in her own right. Whatta a group of talented people! I think you’ve learned well the art of the hook. This will appeal to a wide range of people–there aren’t many Byrnes in the world (at least none that I know) who are NOT worried about age in some way. This will be good for your presentation. Go for it.